We have already learnt about trigonometry in previous units in detail. Trigonometry has its own applications in mathematics and in physics. One such application of trigonometry in mathematics is "height and distances". To know about height and distances, we have to start from the most basic part of that, which is "angle of elevation" and "angle of depression". The first and foremost angles that we are going to study about here is angle of elevation. In this part of height and distances we will be discussing about angle of elevation in detail. 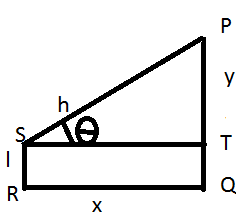 The angle of elevation of an object as seen by the observer is defined as the angle between the horizontal and the line from the object to the observer’s eye. The line in which observer’s eye is there is known as the line of sight. P be the top most point of the pole. Q be the bottom point of the pole. R be the position of the observer’s eye. QR be the distance between the bottom of pole and observer’s eye of ‘x’ units. PR be the line of sight or the line along which observer is observing the top of the pole of ‘h’ units. depending upon the data given in the question, corresponding formula is applied to find out the angle of elevation. Here SR is the height of man as ‘l’ units and height of pole to be considered will be (h - l) units. The line of sight in this case will be PS and angle of elevation will be ‘θ’. QR = ST = x, PS = h.
tan θ = (y- l)/x; cot θ = x/(y - l). 1. The height of a pole is 30 m. A man is standing at a distance of 20 m from the foot of the pole. The man looks at the top most point of the point from the place where he is standing. Find out the angle made by the man’s eye with the top most point of the pole. 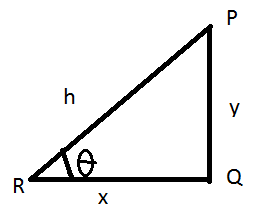 We have to find angle ‘θ’ which the angle made by the man’s eye with the top most point of the pole and is angle of elevation. 2. A ladder of length 30 m is kept in against a wall of length 20m such that their topmost point is in contact with one another and their bottom point are at certain distance as shown in the figure. Find the angle subtended by the ladder on the floor. We have to find angle BAC = angle subtended by ladder on the floor. 3. A man is standing in front of a wall and looking at its topmost point. If the angle of elevation is 60o. If the height of wall is 40m, then find the distance between the foot of the man and the wall. Height of wall, y = 40 m.
Hence distance between foot of man and wall is 23.09 m or 23.1 m.
4. A man of height 1 m 30 cm is standing in front of a tree of height 30m. find the angle of elevation to be made by the man’s eyes so as to look at the topmost point of the tree, if the man is standing at a distance of 5m from the tree. We have to find the angle of elevation, θ = ?